Follow these steps to setup the MeaningCloud VoC Add-in for Excel in your environment and start working. 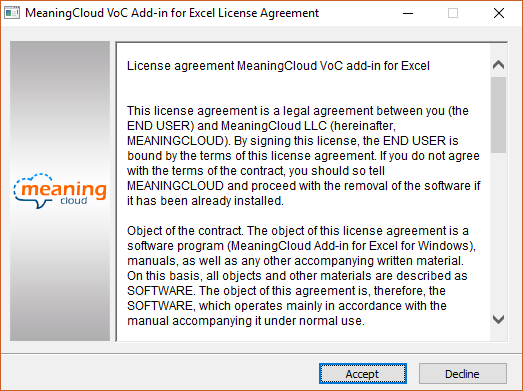 Just click on the following link to download the MeaningCloud VoC Add-in for Excel and when prompted, save the zip file with the add-in to your computer in the folder of your choice. If you have a previous version of the addin installed in your computer, you will have to manually uninstall it first. Check out how in the uninstalling section. 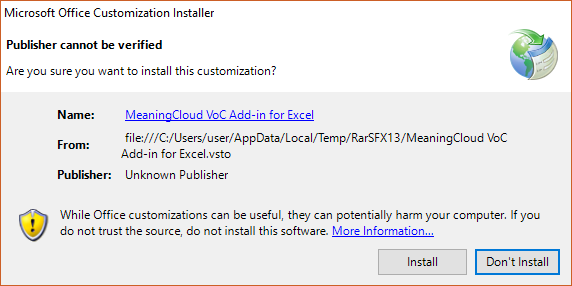 An Excel addin can be removed as any other program installed in your computer: you just have to go to Control Panel\Programs\Programs and Features, select the addin from the list of programs and features (it appears as MeaningCloud VoC Add-in for Excel) and then click on the Uninstall button.